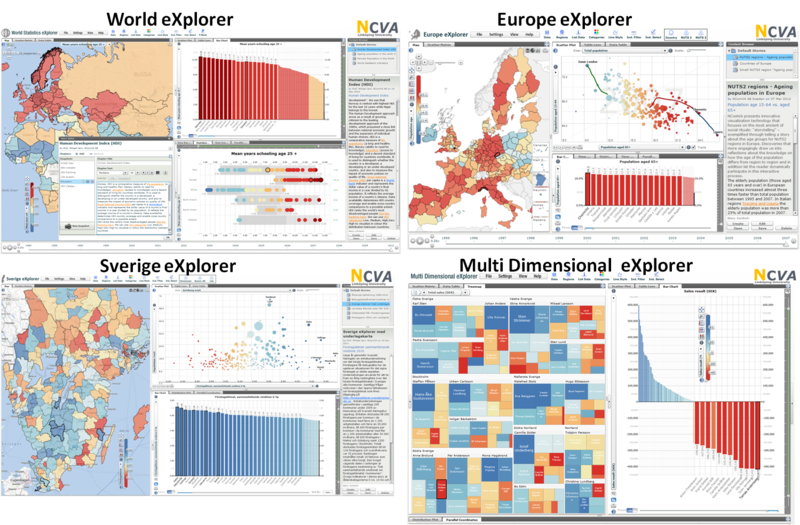 Statistics eXplorer integrates common InfoVis and GeoVis methods required to make sense of statistical data, uncover patterns of interests, gain insight, tell-a-story and finally communicate knowledge. 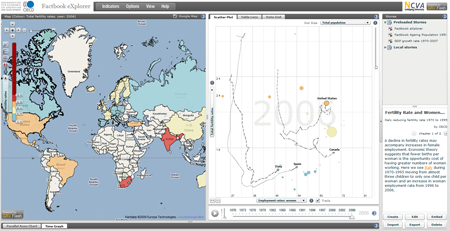 eXplorer was developed based on a component architecture and includes a wide range of visualization techniques integrated in multiple linked views, map, bubble plot, bar chart, parallel coordinates Plot, Distribution Plot and many more, with sophisticated interaction techniques and interactive features supporting data exploration and analysis. eXplorer also supports integrated storytelling with a snapshot mechanism for capturing discoveries made during the exploratory data analysis process which can be used for sharing gained knowledge. Figure: Three linked and coordinated views covering the following visualization methods (choropleth map representing the indicator "age group 65+" , the extended scatter plot shows four indicators "age group young 0-14" (Y-axis), "age group 65+ (X-axis), "age group 65+" (colour) and dot size is related to the indicator "total population" highlighting (Japan, Sweden, China and Niger). The fish eye bar chart uses a focus&context method to highlight about 15 countries (bars in focus) representing countries with highest rate elderly people in 2014 (Japan, Sweden) while the remaining 270 countries (context) are displayed as thin bars. The three graphs are coloured according to the active colour legend "age group 65+". 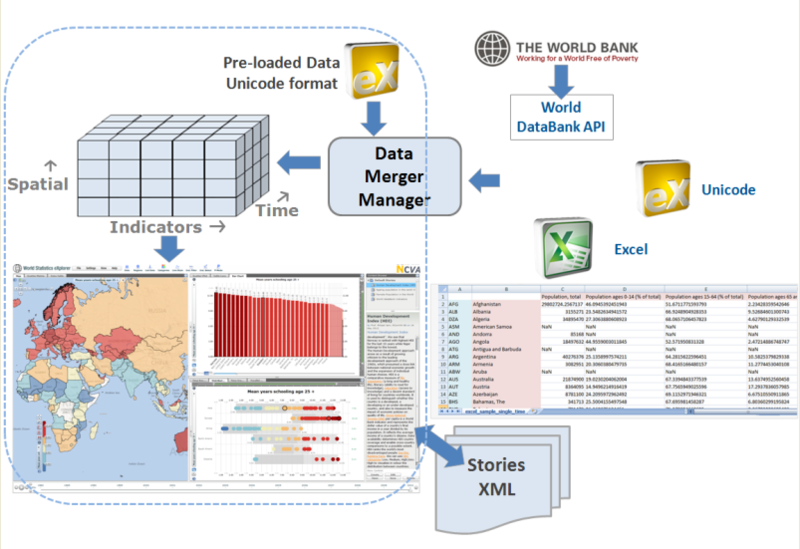 The Story (right panel) represents our Storytelling method and controls how eXplorer will be initiated including selected data, visualization methods, colour legend, selected countries, time step, etc. Figure: Europe eXplorer supports three levels of statistical maps - European Countries and 289 NUTS2 regions and 1391 NUTS3 regions. The same variable "ageing population 65+" is here illustrated using the same class limits (12,14,16,19,20%). The visual result differs dramatically when you use NUTS2 regions instead of countries. We see no ageing problems in Spain when using the average value for countries but when NUTS2 regions are visualised, we see that north west Spain has an ageing population. The same for Germany (East) and Italy (North). 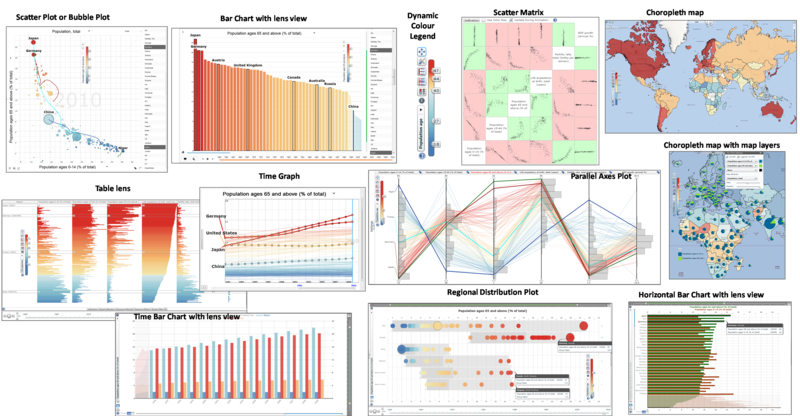 Figure: Statistics eXplorer applications involve the integration of important visualization and analytics taxonomy required to make sense of statistical data – to pursue questions using several famous Geovisual Analytics and InfoVis methods, uncover patterns of interests, gain insight, tell-a-story and finally communicate knowledge. Statistics eXplorer is a web compliant application suite that enables the statistics visualization of socio-economic information at national or detailed territorial level providing clear insight on regional differences and performance within a country and comparison of different areas across countries. 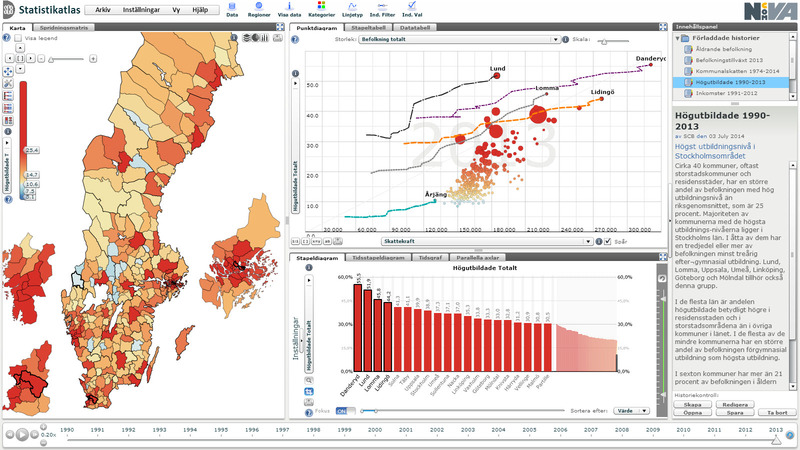 Statistics eXplorer enables users to explore simultaneously spatial, temporal and multivariate data (both numeric and categorical) from multiple perspectives, to discover interesting relationships, to share their incremental discoveries with colleagues and finally to communicate selected relevant knowledge to other users. A Statistics eXplorer application is composed of GeoAnalytics Visualization (GAV) components facilitating a broad collection of dynamic visualization methods developed and integrated for use with the Adobe Flash and Flex development platform. In this respect, Statistics eXplorer represents a leading edge tool being adapted to the Internet and used as a web-enabled toolkit by many international (OECD, IMF, Eorostat,..) and national organizations. 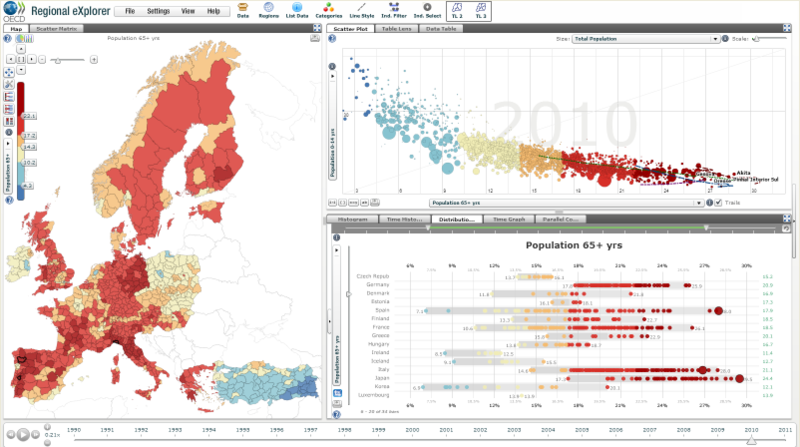 The first public versions of Statistics eXplorer were released in November 2008 installed at SCB http://www.scb.se/statistikatlasen/ and OECD web-site named named OECD Regional eXplorer - see: http://www.oecd.org/gov/regional-policy/regionalstatisticsandindicators.htm . Several extended versions has been released (last in 2016) that enhances the possibility to explore trends over time, provides novel functions for presenting stories about the statistics and combines metadata and maps status. Further developments have resulted in the creation of the following eXplorer versions: World eXplorer, Sverige eXplorer, Europe eXplorer and MDim eXplorer available on this web site. Explore, present and communicate using "Storytelling"
Interactive controls enable the user to enter a visual dialog with the data using a well-known information visualization seeking rule: “analyze first, show the important, zoom, filter and analyze further, details-on-demand”. Visualization methods also provide the foundation for using multiple linked and coordinated views and in the Statistical eXplorer framework applied together with combinations of brushes realizing the overall concept of our framework. The eXplorer applications demonstrates this concept to simultaneously present, explore, and analyze different aspects of multivariate data. The views are used adjacent to each other and include map, scatter plot, bar chart with fish eye view, time graph, parallel coordinates, distribution plot, data table etc. Interesting subsets of the data are interactively selected and brushed, and the relations are investigated in all the linked views. A data-of-interest method is used in all linked views to visually separate interesting data features from the rest of the data. To accomplish this the eXplorer framework uses focus&context defined within information visualization such as the fish eye technique in bar graphs and dynamic queries in parallel coordinates, table lens and an attached color legend extending the analysis capabilities to scenarios with larger data sets. Figure: The eXplorer analytical storytelling loop – A Story with snapshots and metadata is created in the eXplorer Story Editor – Story is saved and can be shared with colleagues to reach consensus – The Story can be accessed by the public. 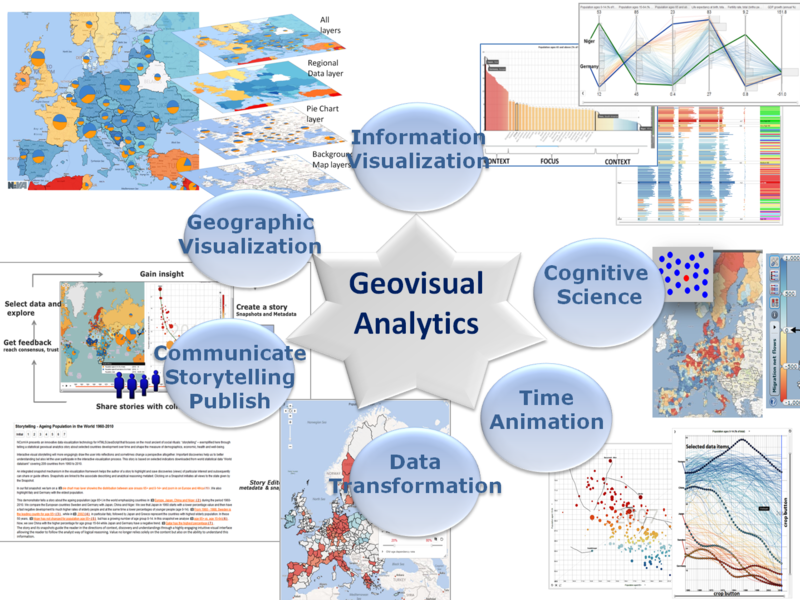 Figure: The following geovisual analytics methods are available and applied in eXplorer applications. MDim eXplorer also provides the Treemap. 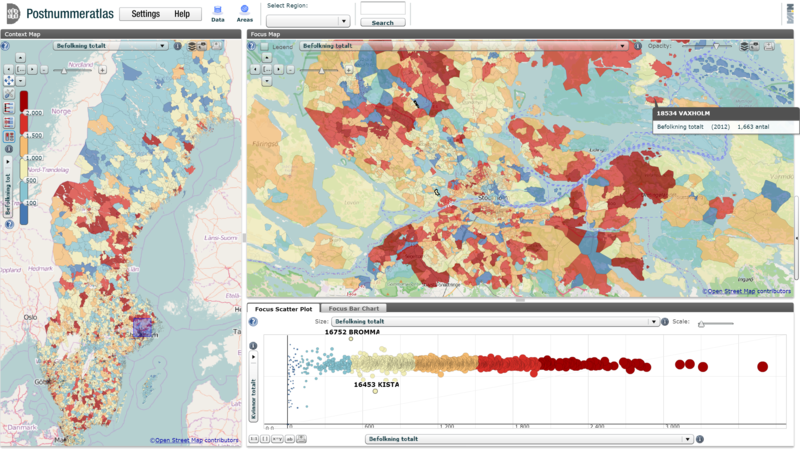 Statistikatlas explores statistical data for Swedish municipalities and counties. This municipality map of Sweden shows "highly educated people" based on statistics from the SCB Statistical Database. Figure: OECD TL3 (simular to Eurostat NUTS3) showing ageing population (65 and above). The Distribution plot shows that Germany and Spain has regions with highest rate of elderly people. OECD countries have experienced a growing interest in regional development in recent years. The performance of regional economies and the effectiveness of regional policy help determine a nation’s growth and shape the measure of well-being across countries. For the past years the OECD has been studying regional disparities and development patterns in its member countries in order to evaluate innovative strategies and diffuse successful policies. 256 preloaded time-related indicators for exploring OECD countries. The most comprehensive data source for exploring socio-economic statistics for OECD countries. Below you find two versions: the OECD Factbook's official Web site and the OECD Factbook eXplorer. The image shows fertility rates vs. employment for women 1970-2006. Swedish Zip Code Regions "Postnummeratlas"
This is another collaborative Geovisual Analytics project between Statistics Sweden and NCVA providing visualization methods for BIG data here represented by more than 10,000 geographical zip code regions and associate indicators. Statistics Sweden (SCB) has provided geographical borders and indicators for almost 10,000 Swedish zip code regions. The above two maps about population show indicator "total population". Indicator about number of females is also available.